Ideally a holiday should captivate the senses, and lift one out of the pressures of everyday life. Circle dance holidays aim to provide this while also offering dance instruction and a sense of community. Many report that circle dance creates a milieu where you don’t have to wear a mask and can be fully yourself. For people who find a spiritual dimension in the diversity of music and moving patterns, a dance holiday gives the time and space where one can explore this fully and deeply. A dance holiday can be a perfect introduction, away from the usual stresses and time constraints. The atmosphere is generally relaxed and supportive (some teachers say “there are no wrong steps, only variations”). Check first to see if an event is suitable for new dancers and ask if there will be introductory level sessions. Dance Camps tend to be large (several hundred people), with a wide range of dance styles and other workshop options. Expect the exciting atmosphere of a festival, with camp fires, drumming and impromptu music. Musicians are usually invited to form a “scratch band” and to perform as part of the dance programme. Many camps provide a programme for children and teenagers and are relatively low-budget. Residential Holidays tend to be smaller (typically 20 – 40 people) and to focus more specifically on circle dancing. When participants travel abroad the programme will usually include outings, walks and encounters with local people and culture; in some instances their main purpose may be to experience the dance traditions and culture of a particular country or area. Some find that a group of this size is conducive to a sense of safety and group harmony. For Day Workshops and Weekend Courses see Grapevine magazine. Twelve days on a glorious organic Pembrokeshire site, big circle dances morn and eve, many other circle dance, creative and other dance, drumming and singing workshops, creative & craft area, creche, wood-fired sauna, well-being area, veggie cafe, shop, hot showers, and loads to do for kids and teens. If you are looking out for a holiday with a difference and you like dancing on Mother Earth, then try Sacred Arts Camp at the end of May in Oxfordshire, and Unicorn Dancing Spirit Camp in August in Somerset. Both camps focus on Dances of Universal Peace, and include a daily outdoor circle dance session in early evening with a live band that create some very wonderful music. Also singing, yoga, bhajan, creativity and games etc…Children & teens welcome. M oments of pure magic with sunsets, birds. The sense of community and co-operation at these camps is rare and miraculous . No drugs, alcohol, and quiet after 11pm make for a peaceful, harmonious week. Mandy de Winter and Judy King lead “”Harmonic Circles – New Year Celebrations in England – Five days of delighting in Circle Dancing, Singing and Music-Making. We also lead various long weekend events around the country and abroad: full details are on our website. Women’s Ritual Dances and Traditions of Greece with Laura Shannon. Workshops/Holidays in Greece (Lesvos, Thassos, Thrace, Mani) for women, focusing on women’s village dances, folk arts and customs, food, rituals, live music and sacred sites. For exact details see www.laurashannon.net. Nevia Mullan organises residential circle dance holidays in her home in Croatia, led by various circle dance teachers. Contact her neviam@hotmail.com or phone 01628 771381. 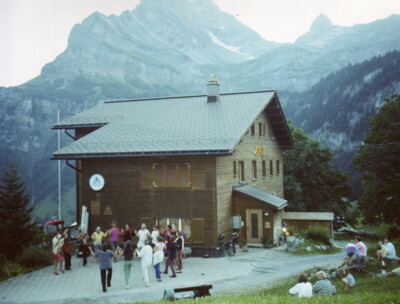 Martine Winnington teaches Nature and Bach Flower dances as well dances for Healing and Regeneration in Yvonand, French Switzerland (one hour from Geneva airport). We dance outdoors in a beautiful Bach Flower garden or a dedicated dance space and practice healing and energy work. Maximum 12 participants. Accommodation is in a campsite, local B&B’s or hotel. Also available : special programme to suit the needs of your own group (7 people minimum). Friendly dance holidays in UK, Turkey, Greece, S. France, Israel and Brazil. Most events incorporate local dancers, musicians, festivities and outings. Circle dance holidays at La Roane, a beautiful woodland centre near the Gorge de l’Aveyron, South West France. Wonderful vegetarian food, swimming, table tennis and excursions as well as lots of circle dancing lead by Anne Armstrong. See www.nigelshamash.com for bookings and further information or annearmstrong@supanet.com. Autumn- Spring Cultural/Circle Dance Holidays at an award-winning sustainably managed Guest House in Southern Morocco as well as tours. Choice of wide variety of activities including charitable work. Groups of up to 16. Circle Dance Holidays in Slovenia.